Use the code PCG to knock 20 percent off tickets. 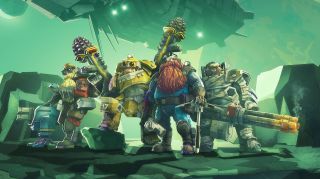 Deep Rock Galactic, developed by co-op focused Danish studio Ghost Ship Games, sees players take on the role of a team of up to four space-based dwarf miners. The co-op shooter has been in closed alpha since December 2016, but is fast approaching its full release. At the Weekender you’ll be able to see just what’s special about the game, with its procedurally generated caves full of valuable minerals to mine and plenty of space beasts to battle on the way. The class-based four-player shooter is sure to prove popular at the event. Find out more over on the official Deep Rock Galactic site, or keep up with the social side of things over on Facebook or Twitter. Deep Rock Galactic will be joined by many more speakers, games and booths all at the PC Gamer Weekender, which is being held February 17-18 at the Olympia, London, in the UK. For more details see the site, and follow us on Twitter for up-to-the-minute news. Tickets are available now from £12.99. Use the code PCG to knock 20 percent off tickets.